Thank you for visiting our website. If you are Professional Grower, Retail Nursery, Landscape Contractor, or interested in quality perennials for any other reason, you have come to the right place. 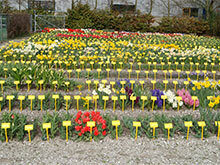 At De Vroomen Bulb Canada we are dedicated to supplying you with the best perennials. Why De Vroomen Garden Products as your supplier of Perennials? 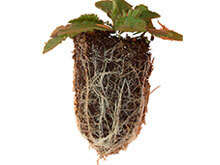 Why use Bare Root Perennials for your Perennial Production? Customers are demanding more diverse plant materials, along with delivery dates that are different than the normal shipping times from Holland. To keep up with the change, we have started our own plug and bare root program in the US, as well as developed partnerships with a group of top quality plant producers of domestic bare roots and plugs. This broadens our ability to service our customers with different plant sizes, shipping possibilities, quality, flexibility and an ongoing desire to meet all your plant needs. 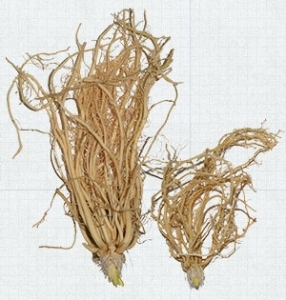 We can offer plugs in 21, 32, 50, 72 and 128 cell plugs as well as additional programs of bare root perennials in larger sizes. Please contact your sales representative or our customer service for additional information about the different possibilities and how these programs can help you sell more plants. Our perennial program begins shipping in early February. The first possible delivery date is around February 1. You are welcome to place your orders in the late fall to make sure the varieties you requested are available. These orders are packed in our production facility in Lisse, Holland. Throughout the spring planting season we maintain a stock in our distribution center in Niagara Falls, ON, for direct shipping. On our website www.devroomen.ca we list the current availability for both our Holland facility and Niagara Falls facility which is updated daily. 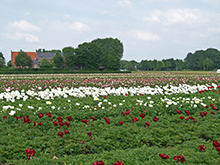 Over the decades De Vroomen has specialized in Peonies. 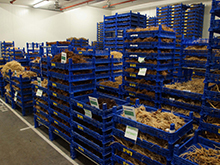 We are the largest exporter of bare root Peonies in the world. Currently we offer over 50 varieties of garden Peonies, 4 varieties of Itoh Peonies and 9 varieties of Japanese Tree Peonies. Bare Root Peonies are available for both fall shipping (delivery starting October 1) and spring shipping (delivery starting February 1). All our Perennials are shipped in sturdy boxes. We have in Niagara Falls, ON. You can either pick up your order there or have it shipped to your front door. Larger orders are regularly shipped on pallets. Smaller orders or re-orders are shipped by UPS. We offer an online track and trace system to follow your shipment. We can pack your orders by plant location. Just send in a PO per location and we will deliver your plants packed accordingly; a convenient service when growing on different locations. 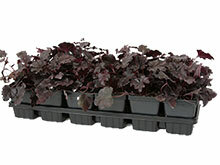 We pack our perennials in special plastic bags that ensure sufficient ventilation. Each bag has the variety, size and amount of plants imprinted. We also register the production process which allows us to track each bag of perennials back to the grower; a valuable instrument to increase quality year after year. Each delivery comes with a detailed packing list. 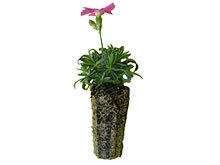 Everyone at our company will make sure we provide you with the best quality perennials. 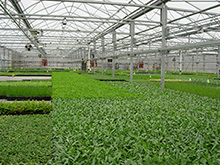 De Vroomen Bulb Canada is known for delivering healthy, true-to-name and true-to-size products. Because Dde Vroomen takes quality seriously, we are a member of the elite Holland Selection organization. tracking and tracing from grower to consumer in order to improve our quality and customer service. Our products are packed in a state of the art production facility in Lisse, Holland. The independent Dutch PD Inspection Service conducts inspections during the production process and thereafter. As well as using independent inspectors, we also have our own staff members to monitor quality, packing of your plants and paperwork. 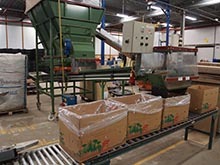 We use modern counting and packing machines for premium packing and a professional logistical system for order picking. Furthermore, we can look back on more than 85 years of perennial exporting knowledge. At De Vroomen, we are trying to help our customers improve their perennial business in any way possible. 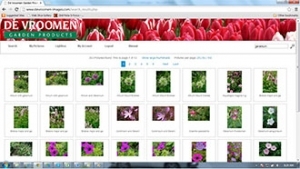 We recently designed an online picture database that will help you as a professional to resell De Vroomen perennials. This database contains all high resolution photo material that is currently owned by De Vroomen. For our customers, these pictures are available to use on your website or in your catalog. You can easily browse the database and select the pictures you would like to receive. Request a login here.